Individual Commentary (pdf file). This book shows the power of the Gospel to transform lives and to transform society. It was written in the same time span as the epistle to the Ephesians and the epistle to the Colossians. Those lofty epistles, with great doctrinal truth, were companion letters being carried to churches in the same area. The three taken together serve to emphasize just how important this little epistle was. It identifies 7 important leadership topics/lessons. Then there is the actual leadership comments on the text. Its inclusion in the Scripture shows us how important the Gospel is in everyday life. Finally there are 25 leadership articles totaling 97 pages describing various aspects of leadership seen in Philemon. This 148 p. book is one of a series of Biblical leadership commentaries. This series explores the most relevant books of the Bible for leadership findings. 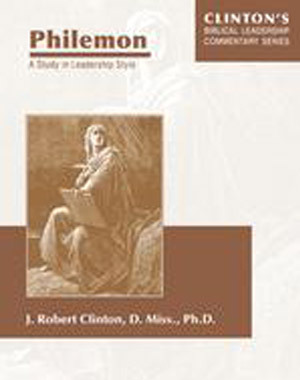 The leadership commentary on Philemon involves a careful analysis of a very mature leader who uses 3 important leadership styles in order to persuade the recipient of the book, Philemon, to receive back a run away slave. This little treatise first gives an overview Philemon, i.e. a recognition of the contribution of this book as a whole to the Bible. Here is one illustration of three transformed lives, a very complex social problem, and how the Gospel requires love to be applied. And most importantly, this book introduces the concept of Pauline leadership styles and we see 3 of them being used in this book. All leaders need to know about leadership styles.